As a social enterprise we try to ensure our day to day running costs are covered by our services, training and of course our very yummy organic produce and crafty products. Running 18 acres, supporting lots of disabled but ambitious farmers and gardeners and keeping our farm in tip top shape takes more than the sale of cucumbers alone. We are truly grateful for the annual donations of time, resources, gifts and grants to keep our unique place growing for the future. We have regular whole day (and sometimes week long) corporate volunteering days on the farm. We offer a very unique team building day, with businesses gifting their workforce and making a massive difference to our charity. Skanska’s Lend a Hand initiative created a fully accessible chicken run for our free range feathered friends. Now all our Co-workers can now take part in the daily care of our hens. This summer Manit’s volunteers have created a new patio area outside our Tea Barn for our Co-worker’s lunchtime. We are indebted to Manit http://manitcontractors.co.uk/, when our rainwater irrigation system sprung a leak in all the wrong places (deep down in the hard to reach organic soil of our Far Field). They sprung to action and donated a mini digger for a few days of heavy excavations. Manit supported the recent groundworks as part of their involvement with Skanska. Thank you Richard and Team! Our farm has been supported by the amazing work corporate work teams of Black Horse Finance who became Composting Conquerors, renovating & re-building our very vital compost area. The medical supply sales team, Ethicon, joined the Farm Team on one of the hottest days of July and sowed all of our garlic bulbs in record making time. Perhaps we should have used a stopwatch and gone for a world record? 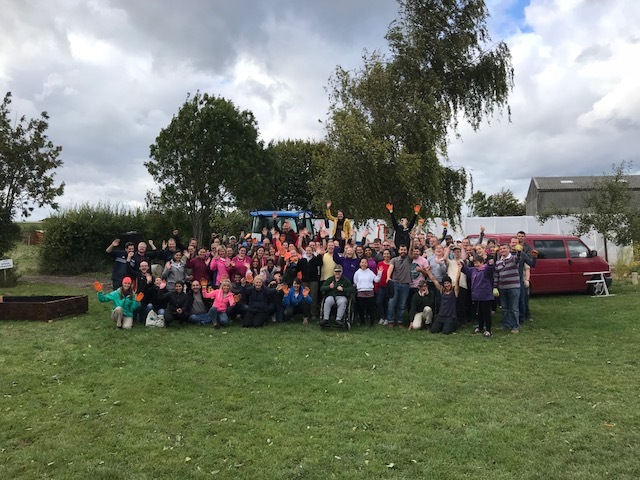 Returning Gilead turned up this year with our biggest party yet, 71 volunteers who transformed the farm with too many work parties to count. We are always seeking fundraisers doing something funny for money, businesses offering their time or expertise or volunteers able to dig dig dig what we do on the farm. Would you like to see your name here in the future? Give us a call we would love to hear from you. We are proud to work in partnership with Employee Volunteering!